In a head-to-head match up of tire-shredding horsepower against high-flying afterburner thrust, the new 500 hp Dodge Viper SRT-10 challenged the United States Air Force's leading multi-role fighter in acceleration trials held at Luke Air Force Base in Glendale, Arizona. The event was held March 23-24 2002, as part of the annual Luke Days air show. "Ripley's Believe It Or Not," TBS Superstation's original reality series hosted by Dean Cain, was on hand to tape the race. The program will air the outcome of the race July 10. "It was an absolutely awesome ride," said Herb Helbig, Senior Manager, Vehicle Synthesis, Performance Vehicle Operations (PVO) at DaimlerChrysler Corp. "Ripley's got us racing the jet both times -- with and without afterburners -- using the Dodge Viper SRT-10 and the Competition Coupe. There were almost 140,000 people in attendance, and they were all lining the fences cheering their hearts out for their favorite Viper." Billed as "Viper vs. Viper," the race pitted car against jet in a side-by-side, standing-start, 1/2-mile drag race on parallel air base runways. 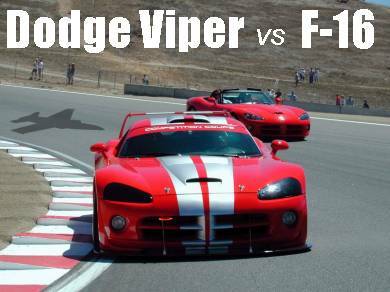 Dodge Vipers raced the F-16 -- nicknamed the "Viper" -- to the speed at which the jet became airborne: approximately 150 mph. The Dodge Viper covered the course in around 15 seconds. Both the first and second days' races featured a pre-production version of the 2003 Dodge Viper SRT-10 convertible, driven by Helbig, against the Lockheed Martin F-16 Fighting Falcon, flown at military power by Captain Glen "Nugget" Richards of the 309th Fighter Squadron (known as the "Wild Ducks") based at Luke AFB. 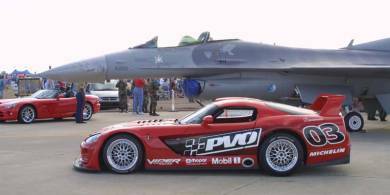 Each day then pitted a prototype 2003 Dodge Viper Competition Coupe against another F-16 Viper flown by Captain Dan Potas -- call sign "Scrappy" -- also from the Wild Ducks. For the second showdown, DaimlerChrysler's PVO team would tap more horsepower and make their runs on racing slicks, while the USAF countered with a takeoff run at full afterburner. In the "tale of the tape," the F-16 boasts approximately 25,000 pounds of thrust in a compact, 19,000-pound package capable of more than 1,500 mph. In comparison, the Dodge Viper's 500-plus pound-feet of torque, 3,357-pound curb weight and 190 mph top speed earn it the honor of being America's Ultimate Sportscar. "It was a chance for us to have a little fun," added Helbig. "We're proud of the Dodge Viper's performance capabilities, and this was a chance to race for bragging rights against one of the few things capable of matching the Viper's acceleration. We're also very proud to have been invited here to support Luke Air Force Base and our nation's military." The Luke Days air show is hosted by the USAF 56th Fighter Wing, the nation's largest, under the command of Brig. General Steve Sargeant. Luke AFB is the primary training ground for United States F-16 pilots, playing a key role in U.S. national defense. The Competition Coupe's predecessor -- called the Dodge Viper GTS-R -- earned five international GT championships including the 1999 and 2000 American Le Mans Series GTS Class titles, and the 1997-1999 FIA GT Championships. The Viper finished 1-2 in the Le Mans 24 Hours GTS class in three consecutive years and notched an overall win at the 2000 Rolex 24 Hours of Daytona, the first for an American production-based car.